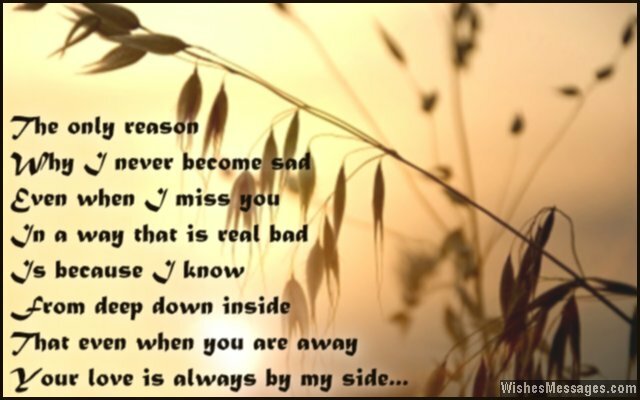 I Miss You Poems for Wife: It is a funny misconception that men don’t miss their wives when they are apart. Guys may find it difficult to express themselves, but that should not be mistaken for being cold-hearted towards their better halves. If you can relate to this and you miss your wife when she is at work or traveling for business, write a short poem to say how much you are missing her. Post your cute quotes on Facebook and Pinterest, send them to her in text messages and emails. Remember that expressing your love for your wife will not make you seem any less tough or macho. In fact, baring your heart to your wife will earn you a lot of brownie points in the form of romantic hugs, kisses and a lot more when she is back in your arms again.